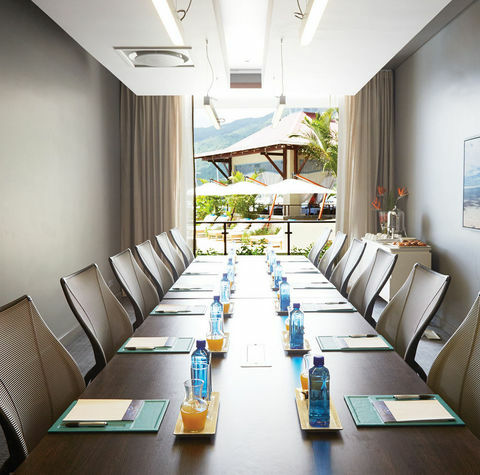 Eden Bleu Hotel combines an idyllic setting with the most advanced Seychelles conferences and meetings facilities in the Indian Ocean. There are no conventional drop-down screens or data projectors. Instead, our facilities are equipped with high-definition LED screens to which presentations, HD videos and other content can be streamed wirelessly.Besides the visual quality the other advantage is that the screens aren't light sensitive, so delegates don't need to sit in the dark. Natural light enhances the capaciousness of the high-ceiling space, making it a versatile venue for anything from a product launch to a wedding reception. The technology extends to the business centre and four meeting rooms, where touch panel smartboards can be interfaced with a laptop or other devices and notes can be e-mailed directly from the screen. Our Seychelles conferences and banqueting menus range from traditional favourites to local specialities. The banqueting team can also adapt the menu to suit the event. 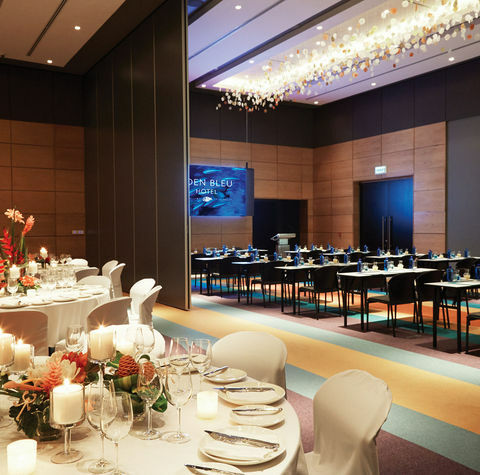 Ball Room A and B can be combined to accommodate up to 240 guests for a gala banquet, 168 delegate classroom or 340 theatre style. For more intimate gatherings, we have four executive boardrooms available for business meetings or private dining experiences. "Thanks for all your professional expertise and help in making yesterday's event such a resounding success!"